It's only natural that the next Star Wars model kit is C-3PO, to go with the recently unveiled R2-D2 — and C-3PO's grand début in the 6-inch scale is certainly impressive. So shiny! The 6-inch model is the first Threepio to ever be released in the scale, as the character has yet to appear in Hasbro's Black Series line of toys, and he's looking great. 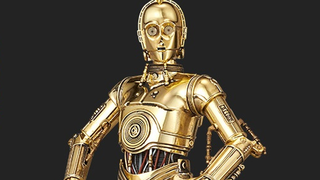 Rather than being based on a specific movie, he's sort of an Ur-C-3PO, with included alternate chest pieces to show the character with the restraining bolt on from A New Hope (and even a matching dented head), or with the stormtrooper communicator he clutches on board the Death Star. He's even, quite amazingly, got a pull out eye to recreate Salacious Crumb's attack on the hapless droid in Return of the Jedi. And hey, if you break the model down into pieces, you've also got an Empire Strikes Back version! Har har. Threepio will be out in Japan late next month, and will sell for 3,780 yen — around $31.